Lopirel Tablet: Each film-coated tablet contains Clopidogrel bisulphate INN equivalent to Clopidogrel 75 mg.
Lopirel (Clopidogrel) is an inhibitor of platelet aggregation. Lopirel (Clopidogrel) selectively inhibits the binding of adenosine diphosphate (ADP) to its platelet receptor and the subsequent ADP-mediated activation of the glycoprotein GPIIb/IIIa complex, thereby inhibiting platelet aggregation. 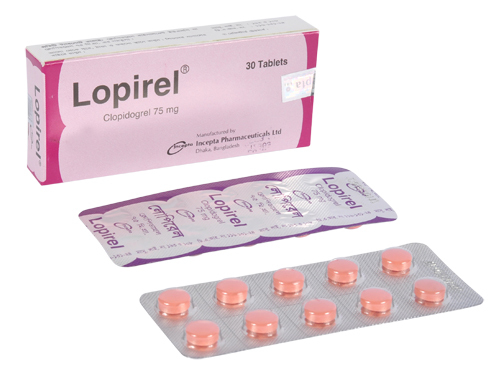 Lopirel (Clopidogrel) is indicated for the reduction of atherosclerotic events (myocardial infarction, ischaemic stroke, and vascular death) in patients with atherosclerosis documented by recent stroke, recent myocardial infarction, or established peripheral arterial disease. The recommended dose of Lopirel (Clopidogrel) is 75 mg once daily with or without food. Nursing Mother: Clopidogrel is not recommended for use while breast-feeding. It is not known for sure whether Clopidogrel is excreted in breast milk, although it is suspected that it is. Safety and effectiveness of Clopidogrel in pediatric population have not been established.